The biggest holiday in Beer comes back to The Bronx. 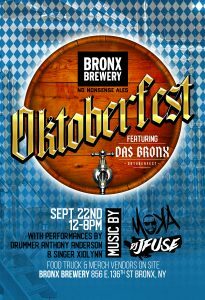 We’re talking Oktoberfest, and this one is especially exciting as we’re going to introducing our new version of DAS BRONX, an Oktoberfest Style Lager and serving it alongside German Pretzels and other local eats. Don’t miss a chance for the limited edition stein we’ll be selling to the first 150 people who buy tickets online. Music for the event includes DJ J Fuse, DJ Moka, Anthony Anderson and Xio Lynn, plus a variety of food and merch vendors!